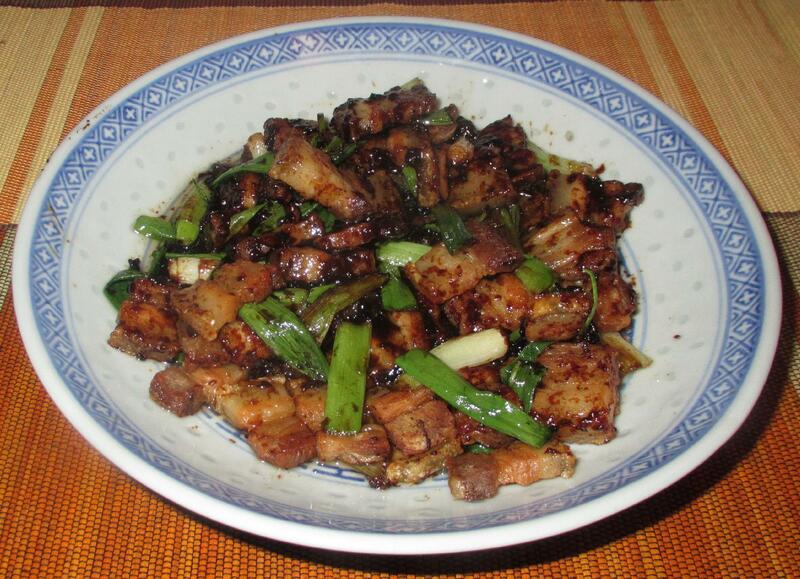 The name of this very common and classic Chinese dish, 回鍋肉 (huíguō ròu), translates directly as ‘Return to the Pot Pork’. 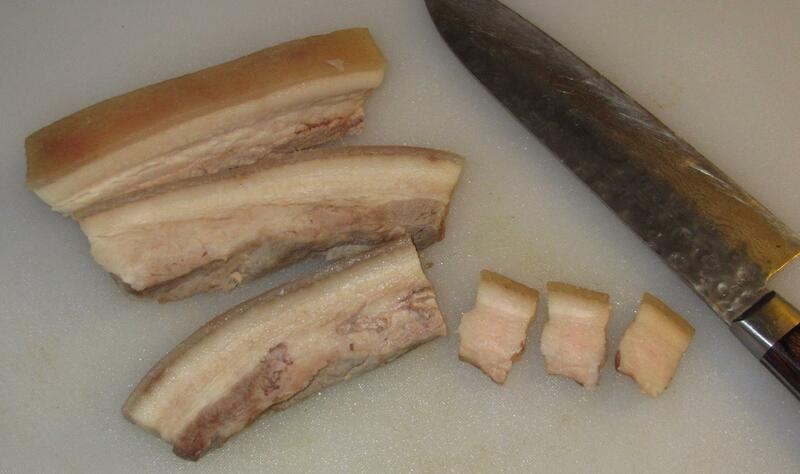 In English, however, it is usually rendered as ‘Twice-Cooked Pork’ as two separate processes are used for cooking the meat. 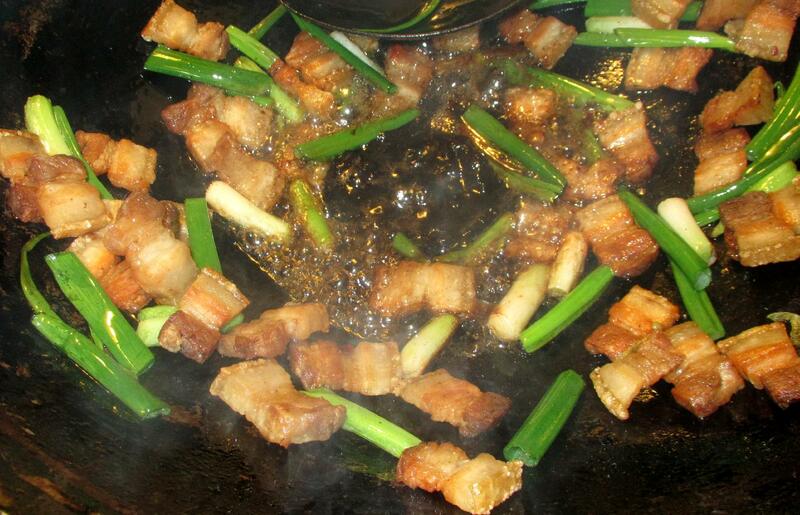 Basically, a fatty cut (most commonly Pork Belly) is simmered in a flavored liquid, then cooled, sliced, and fried, typically with a vegetable or two. 1 chopped Green Pepper (not used here but see the notes at the end). Bring the water to a moderate boil and add one of the scallions along with the ginger, garlic, salt and peppercorns. 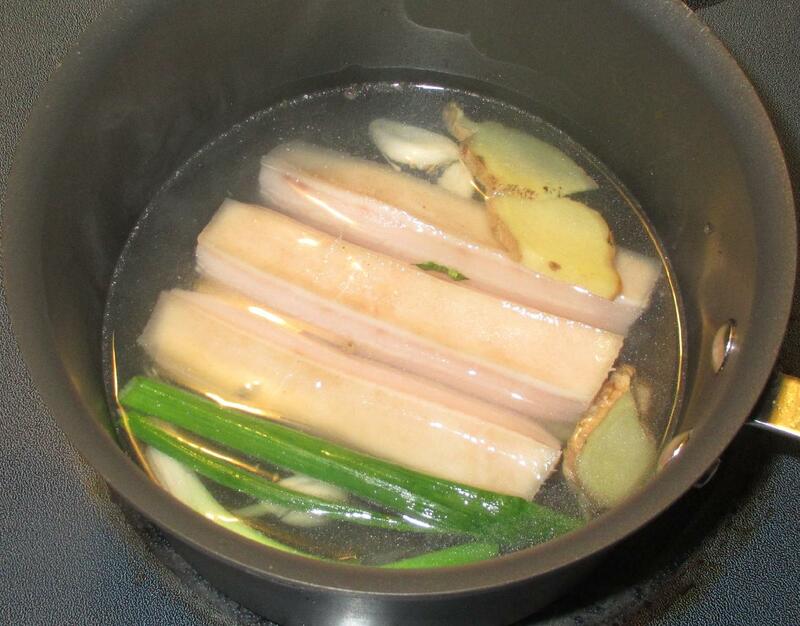 Continue to boil gently until the flavors of the solids infuse the water and then add the pork. You can cook this in a solid single piece, if you like, but it is better to cut it into two or three sections to allow the flavors to penetrate more thoroughly. Cook the meat at a moderately vigorous simmer for about twenty minutes and the remove the meat to cool. You can discard the cooking liquid if you like, but it is useful to keep for the stockpot. While the meat is cooling, you can slice the remaining scallions into sections about 2 – 3 inches long, keeping the white parts separate from the green. Once the meat is cool (and it is a good idea to chill it in the refrigerator), slice it into pieces the size of large postage stamps. Some versions cut the slices almost paper thin but I prefer more substantial pieces about a third of an inch thick. Heat a couple of tablespoons of oil in a pan over high heat and when the oil starts to shimmer, add the pork, a bit at a time, and sauté. You don’t want to vigorously toss and stir here, rather allow the pieces to brown, turning as needed, until they start to get a bit crispy on the surface. 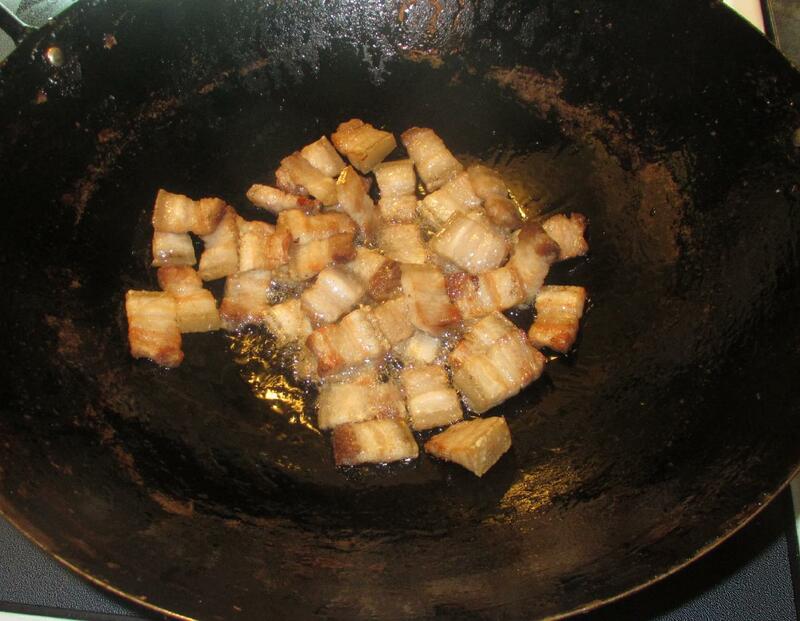 The pork will throw off a good deal of fat while frying and you will need to pour off all but a tablespoon or so before continuing. Add the white parts of the scallion and, as soon as they begin to soften slightly, add in the green parts and toss quickly. 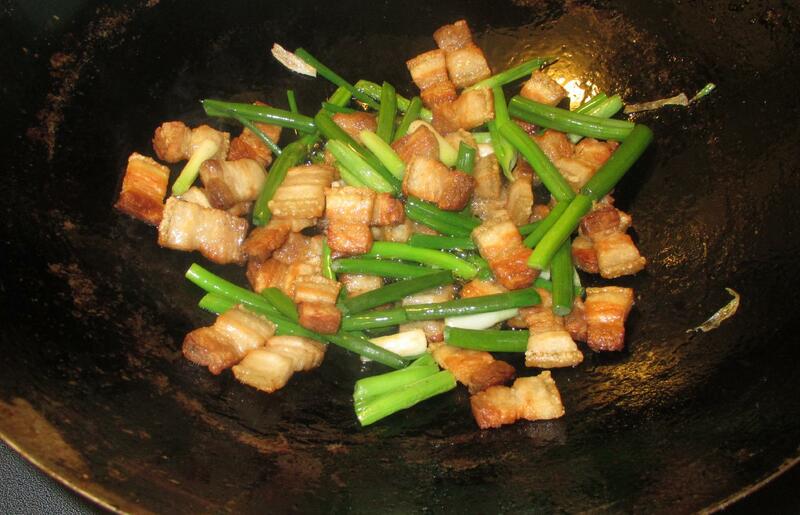 When the scallion greens are just wilted, make a ‘well’ in the center of the pan and add the bean sauce, sugar and vinegar. Stir to form a sauce and as it thickens, toss everything together until the sauce coats the solid ingredients. Plate and serve immediately. NOTES: The variety of bean sauce I was using on this occasion is quite dark; almost black, in fact. There are lighter varieties available and, for the appearance of the final dish, I would prefer one of these. The result here was really delicious but the amount of meat and scallion made for only tiny portions for my wife and me. I love this dish made with green bell pepper but my wife is not so keen on that so I just used the scallion on this occasion. If you make this this recipe, I recommend that you cut up a good size pepper and add it to the pan at the same time as the white part of the onions. Sounds really delicious. I will have to give your version a try and will take note of your notes regarding the bean sauce but it looks great to me just the way it is. I’m always on alert for a good pork recipe. I have little experience with it, and have a son-in-law who enjoys it…and I must admit, this really does look delicious! I think we’d be a split household on the green pepper, too, but I would love that addition!